Young kids need lots of books in their lives. Just like they need lots of cuddles, songs, rhymes, creative play and time to moodle. If you want to boost your pre-schoolers' literature intake, here's a posy of recently published children's picture books to seek out when you're next in the book store or library. This is the sort of children's picture book that kids can memorise and 'read' very quickly. Most kids know the song 'If You're Happy and You Know It' so they'll quickly pick up on pages like "If you're a meerkat and you know it, sit and stare." If You're Cheeky and You Know It makes a fun read-aloud, and kids will go ape over instructions like "If you're a monkey and you know it, pull a face." The illustrations are bold, bright and bursting with crazy humour. Is there ever a child who doesn't love the circus? I think they'll also enjoy this delightful children's picture book about a circus odd-job man who discovers he has a circus act of his own. Omar eventually shares the limelight with all the other circus stars in a feel-good story with gentle pastel illustrations. You won't believe what the bear sees over this mountain! Sing along with favourite children's entertainer Jay Laga'aia's bonus CD recording! Books with accompanying CDs are a nice way to vary children's reading diet. This CD not only encourages kids to sing along but side 2 has an instrumental version, the perfect excuse for Kinder Karaoke! Follow the owls in this fun counting book - all the way back to the nest! Keep a look-out on every page for hidden numbers to find. Kids will have loads of fun learning to count backwards with dancing owls, skating owls, and even owls at the movies! Based along the lines of the song Ten Green Bottles, this counting book follows a simple and predictable format for the numbers 1-10. Numbers to find on each page and quirky hooting owls engaged in activities like skate-boarding and knitting will please young readers. Every night, Lukas sat on the edge of his bed waiting for the monster. The monster was enormous and VERY frightening. Finally, tired and fed up with being afraid, Lukas decided to catch it. He hatched a plan involving super-duper, yummy-tummy chocolate chip cookies. This is the story of what happened next . . . Most kids go through a time when they are afraid of something and want to learn to face their fears. I believe children's books can be a great help, as they are a way to have kids think about a possible solution without any "preaching". How to Catch a Monster presents Lukas's dilemma over his scary monster and shows kids how the problem became less. Lukas's way may not work for every child, but it's important for kids to realise there ARE positive outcomes in such situations. This children's picture book is beautifully evocative. Lyrical text is supported by an illustrative style that conveys so much with what at first glance seem to be water colour splotches and squiggly lines. 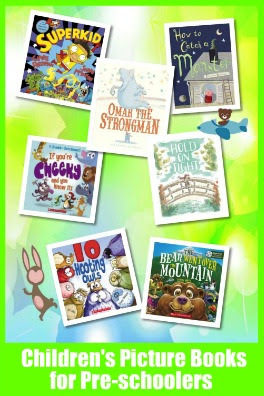 It's a great choice for parents who want to introduce pre-schoolers to poetry in a format that will read like a story. Hold on Tight also makes a wonderful read-aloud, and kids will love identifying hinted-at shapes in some of the scenes. Superkid may look like an ordinary schoolboy, but don’t be fooled! He’s super-fast, super-brave and has x-ray vision. He can defeat any bully, petrify pirates and even make broccoli disappear! Superkid has bravery by the bagful, and he’s always ready to save the day… A charming picture book about the hero within every child, written by the bestselling author of Aliens Love Underpants. There are lots of fun cartoonish capers in this colourful children's picture book. It zings with superhero action and sounds, and gives kids lots to look at, explore and think about. Personally, I've always suspected the kid who sat next to me at school was a superhero! As for me, I'm off to change into my cape in the nearest phone booth. I'll read anything that is included in a posy :) . And all 2013 to boot? You bet I'll look them up. Thanks Susan!